Manufacturer & Exporter of Analog Iron Loss Tester. Our product range also comprises of Power Analyzer, Power Meter and Digital Iron Loss Testers. 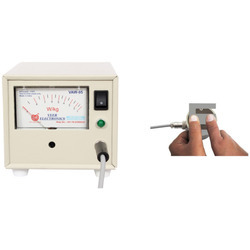 We offer a wide range of Analog Iron Loss Tester, which is used to measure iron loss of electrical steel sheet of thickness. this portable instrument provides easy and fast measurement. it the result can be obtained by simple method of testing. to conduct this testing operation a yoke type probe must be put on a small test specimen and the result of the test will be generated instantly. Power Consumption Less than 15 VA approx.